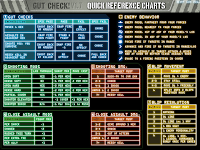 Quick update: After some terriffic feedback from Xerus, I've made some adjustments and uploaded a fancy new QRC on the Gut Check! Page. I'm going to be doing a lot more material as images like the QRC. It's much easier to upload an image to Blogger than link an outside file, plus it looks nifty on mobile tablets or laptops. I know it not very print-friendly, and I will be making "vanilla" print friendly ones in future, but for now I'm staying paperless (my printer is out of ink) and using my iPad for playtesting. Next: Updated Rosters for Lurhgg, Octopods, battle robots, Zeig Troopers and more missions. 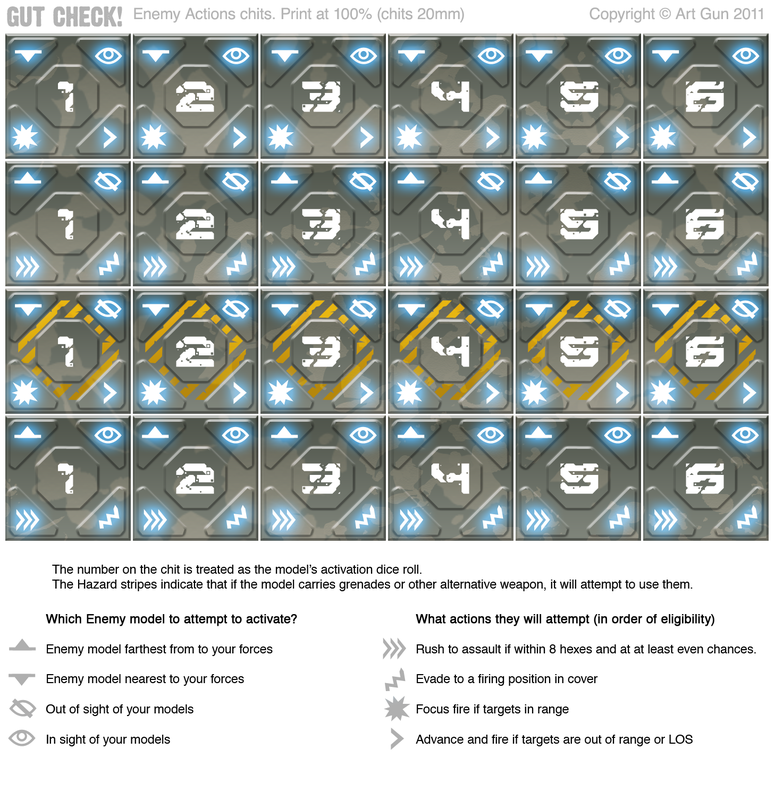 For those play-testing the game, I just added the counter sheet for enemy actions to the Gut Check! page. I have also posted it on the Gut Check! page on this site. 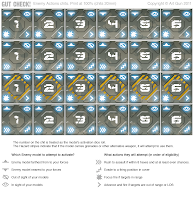 Here are the counters I use for playing Gut Check! -some sci-fi D6 I got from the hobby shop for rolling initiative.. Keeps me from accidentally rolling them during the turn. -A Litko micro blast marker. I use these for Shock Counters. -A blue 12mm counter from Em-4 , used to show the figure is using the evade action and is at -1 to shoot at. -A white 12mm counter from Em-4 , used as a Stopped counter. This is when the model has either failed it's activation roll or finished it's action.. In both cases the model is considered to have Stopped. And finally here is the little plastic box I keep everything in. You can see a D20 I use as a turn counter, red and black counters currently spare, and some amber blips, again from Litko. I really like laser cut acrylic counters, otherwise I would probably have made some print and play ones for GC! already. I will have a go at some soon for those wanting to play without spending any more money. I have been thinking of mounting oil barrels and other debris on the black counters to make 3d Evade counters. I'm starting to really like the idea of fully 3d counters for a better looking battlefield. These painted bounty hunters are going out to a lucky follower this week! I've changed the game, so to speak.. I was about to randomize a winner but thought about it a bit harder and decided on a better idea. 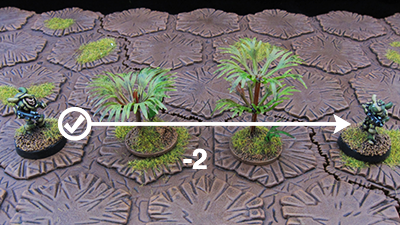 To make sure that the winner is someone who actually will game with these models, there are 2 simple rules of entry. 2. You must send an email to thespacejacker(at)gmail.com with the subject "Wanted:Bounty Hunters"
and a short description (no longer than a paragraph) of who you will be sending them after. Whichever target seems best suited will win the prize.. I look forward to your responses, good luck! After a game using playing card to control the enemy models in Gut Check! I was happy with how the rules worked, but found it irritating to re-shuffle the cards each turn. To remedy this, I designed some square chits to print out and draw from a bag (I'm going to get a £1.05 velveteen dice pouch from em-4 next time I order from them). 1. Which enemy model? This indicates the nearest one to any of your forces. 2. Further detail- This indicates a preference for an enemy out of your model's LOS if possible. 3. Special action-If the Hazard stripes are present, this indicates that the model will attempt to use grenades or whichever specialized attack it may possess. Otherwise, ignore. 4. 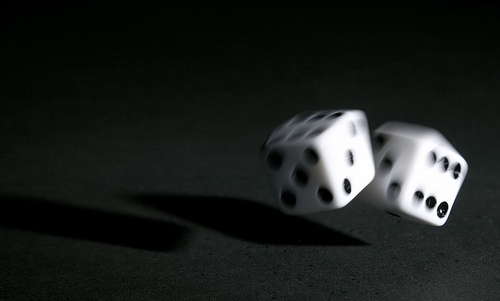 This is the activation "Dice roll" that determines wether or not the model gets to take an action or stop. 5. This is the first choice for what Action the model will perform. (in this case, Focus Fire) If not possible, go to the next option. 6. This is the action the model will take if the first is not possible. In this case it is Advance. This system tells you which enemy model, whether it activates or not, and what it will try to do... All with a single chit draw! At the end of the turn, just throw all the chits drawn back in the bag and give it a shake. The chits look OK.. But I think they need to be higher contrast. I would also love to see them done in laser-cut acrylic one day. Painted this guy up while finishing my Khurasan secret project today. I think his SAW is far more recognizable now, although on the table it's still a bit samey at distance as I stuck to a vaguely military paint scheme. This is a problem with 15mm paint schemes.. The ones I like best are semi realistic.. But on the table they tend to be difficult to see differences in well. Which is the point of military uniforms I guess. I am amazed to see this morning that I have 100 followers on this little blog.. It's really nice to think that what started out as a self motivational blog has ended up entertaining so many people. I've ended up with way more on my hobby plate than I first intended when I got back into miniatures painting. The idea was I'd dabble a bit with a few tiny minis and it wouldn't matter if they turned out a bit crummy. I do spend less time obsessing over the paintjobs than I used to back in the 28mm days.. but that means I get them done faster, which means I buy more. It's a downward spiral from there, I have a decent sized Lead Hillock growing under my desk. 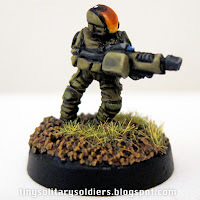 A testament to how fantastic the 15mm sci-fi community is that in the course of this blog I've been honored to paint figures for Khurasan and Blue Moon Manufacturing.. Something I never imagined happening. Most of my recent painting has been on a secret new release for Khurasan, can't wait to get it finished off and see it released! Anyway, thanks to each and every one of the folks following this blog, I promise to keep making free Gut Check! material, do more tutorials (Maybe one on, say, basing.. I can't decide..) and this week will be giving away prize to one of my loyal readers. I need more space in my figure case so I decided that some painted minis are in order. Which ones would be the most use to the 15mm sci-fi enthusiast? That's easy, Bounty hunters! In this case from Critical Mass' Mercenaries range. One lucky follower will win this set of minis! On Monday I will roll some percentile dice vs my follower list and determine who gets the prize. I will contact that person by email and if they respond will mail them the prize. Entirely unnecessary, but fun to use.. 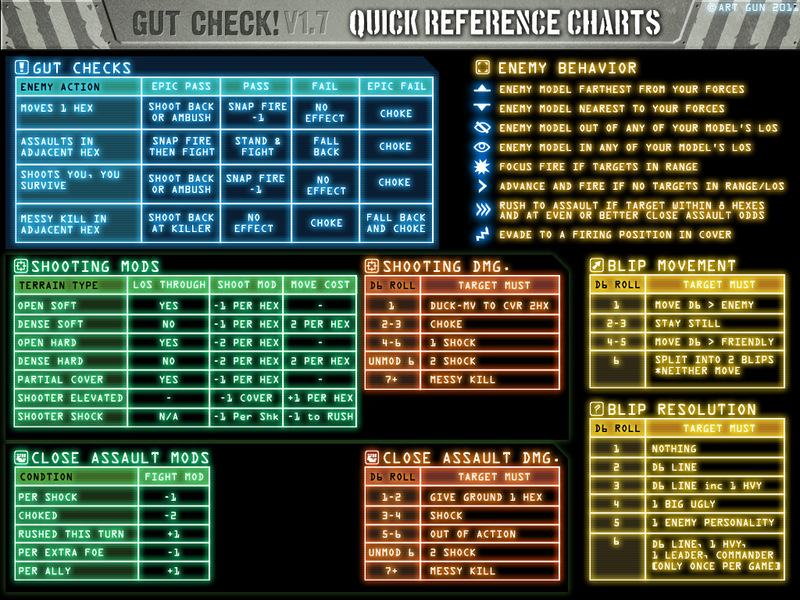 Here is my iPad version of a roster sheet layout for the Gut Check! game. I made everything a bit large so it would be easy to read set up on the side of the table. As I write this post I just turned my iPad sideways to pop it into a stand next to my computer and realized that the image is perfectly readable when only 768 pixels high instead of wide.. So I may try turning the image sideways and fitting more stuff in. If I remove the icon legend and do some shrinking it may be possible to fit both force rosters onto one page, which would be more convenient. Here is my first stab at a build points system in an attempt to have games work out "mostly fair" or at least make scenarios easier to write. The theory is that the higher the BP of your squad, either the more victory points you will require to win or you will encounter more blips. At the very least you could stat up a force and fight them all revealed at the start of the battle. 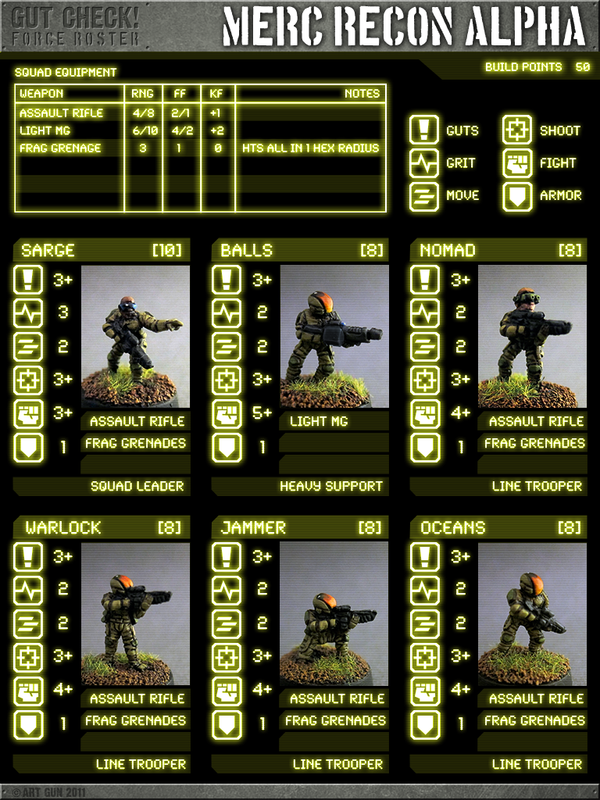 Last night I was photographing my UNSC squad for a new super-fancy iPad version of the Gut Check! roster sheets (upcoming post) and was once again irritated that my SAW trooper looks not very different to the others at distance. The prone figure is very clearly sporting a heavy weapon, but I don't really like using the prone figures as their bases are huge. So I decided to try sculpting an ammo bin with greenstuff. I think it came out pretty well, and may try giving him a large backpack to further identify him. For future squads I think I will do all of the above and also give him some sort of head swap or conversion.. Perhaps attempt to model a targeter onto the helmet. I'm going to paint the ribbed top of the gun blue to try to look like glowing coolant coils when I paint the ammo bin. Gut Check! 1.5 up.. Now with Photo examples! More playesting has borne v1.5 of the rules and a new camera has finally allowed me to take example photos for them. Also included are numerous tweaks and fixed typos. Hopefully all this will make the game a lot easier to understand, although the file size has shot up ;) I'm feeling like the rules are now complete and will allow a single (included) scenario game to be played. It's been fun playing the game and worth the hard work. Big thanks to Mik's Minis Blog, and Miniature Wargaming.com for promoting these rules, much appreciated! This week I've been busy retrofitting my old ruins to work on my Heroscape hex board and painting some brand new models for Khurasan (Exciting! Also very secret!) I finished these jobs so tonight as a reward I played a few more games of Gut Check! and ironed out some kinks. Power armor worked very nicely. It definitely protected the Mercs from death against the relatively weak weapons of the Octopods, but deaths are still possible and the Mercs often choked when hit with massed fire. The tokens I ordered from Litko and Em4 really helped both the look and the playability of the game. To recap, the game now uses Shock counters (micro blast markers) to track damage and general disorder, Stopped counters (white 12mm discs) to keep track of who has acted, Choke counters (Micro skulls) to show when a model can no longer act or react for the turn, and Evade markers (Blue 12mm discs) to show that a model is evading and benefits from a -1 to be hit. Choked and Evade counters both replace a stopped counter, so there is much less clutter than my earlier system. The revised Blip rules and new (very rough) Build Points system are very promising. Happy with the variety of results they provide. If I work a bit more on the Build Points system, I can take a break from doing rosters and let people figure out their own model collections (It's very easy so far). The PDFs are all up on the Gut Check! page, so please check them out if you are interested. 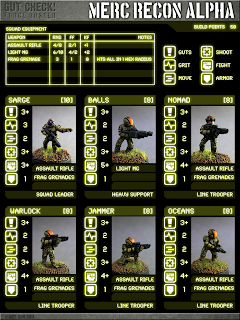 TMP is a great site with tons of useful information for anyone interested in gaming or modeling toy soldiers, if by some miracle you don't frequent it, you should. Thank you, whoever you are.. What a nice thing to do! 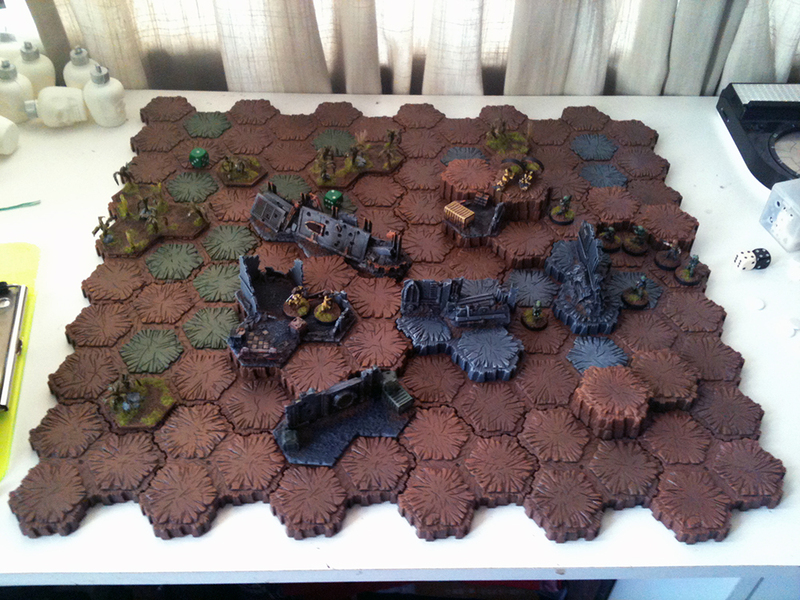 The finished jungle hexes with an undercoated US Special Forces model by The Scene for scale. Sometimes when I don't have much time to paint, I work on terrain as it's more suited to doing in small stages and leaving for a while. when I'm doing a figure, I like to keep momentum on it until it's done. Here is how I made my "LOS blocking" jungle hexes. I used some single-hex Heroscape terrain tiles and some inexpensive aquarium plants I got from ebay for about £5. There are tons in the bag and this will probably last me as long as I want to keep making them. I began by cutting off some plant sections so they would be of tree like height rather than scrub or undergrowth. These sections would not be accepting figure bases inside so I wanted pieces that would block lines of sight entirely. While cutting and positioning them I noticed how flexible they were. I think in future, making some forest sections that figures can be placed in will be quite easy. The down side is that they can't be painted conventionally, but I will get to that further down the post. I then pulled all the plants out again and set about using PVA glue to put rocks, sand and kitty litter on top of the hexes.I made sure that I didn't put any large rocks too close to the holes, so the plant bases would fit. Once dry, I gave them a coat of watered down PVA to keep everything solid. Then allowed to dry. I used citadel foundation black undercoat to paint the sand and rocks. I left the sides of the hexes because I am afraid of getting too thick a layer of paint that could prevent them fitting together. I then painted GW Foundation Calthan brown directly onto the plastic sides. I washed the sides of the hex with my own homemade devlan mud future wax mixture, then drybrushed the piece with lighter shades of brown as I would with any of my bases. The plants looked good, but as they are semi-transparent and brightly coloured, to my eye they didn't quite look right. I washed them with a mix of future wax and ink and was a little surprised to find that it stuck and didn't flake off. When this had dried I drybrushed (rather messily) them whole plant bits with Vallejo lime green. They don't look as good as a hard plastic model would if painted this way, but I'm happy with the result. I just uploaded fresh PDFs to the frequently reformatted Gut Check! downloads page. The Rules now include: Movement clarification, the revised damage system, a mission using unknown enemy (Blips) rules, and a revised Weapons chart. From now on I will try to include everything (like the weapons chart) in the rules PDF. Also there is a sample roster sheet for Khurasan Luhrrgh and human Mercenaries and a Quick Reference PDF that just contains all the charts from the rules. This version is probably the most playable so far and as far as the core mechanics go I would say final. Next comes a narrative campaign system, mission/roster sheets and more scenarios. Obviously not everybody has a Heroscape set lying around and I intend to create a PDF of print and play hex sections for those people. In the meantime, if you just change "1 hex" to "40mm" you can probably play the game on your usual wargame table with the application of some common sense. The most difficult part will be firing arc.. As one of my favourite things about the game is that it uses a limited firing arc to enable flanking and encirclement tactics, which the hexes make very easy to determine. I've been working on refining the Gut Check! rules, and got them to a 1.2 state last night. I overhauled the enemy tactics and behavior system, tidied up some things and began. One thing I haven't mentioned in the rules yet is how to handle terrain exactly, particularly elevation. I counted each hex of elevation as +1 to the range when firing up, but not down in this game and it seemed to work well. Weapons now have an absolute 'effective range' instead of more modifiers for extreme ranges. I wrote a bare bones unknown enemy (blips) set of directions that worked pretty well too. In this game, I pit a unit of Mercenaries against rules-controlled Lurhgg. To summarize, the Lurhgg moved faster and were superior in close combat, but had less guts and crummier guns. I have ordered some counters from Litko to use with the game, but they have not arrived yet so I made do with some little red and white ones I got from em4. The game went well. The Mercs did OK until they lost their leader to long range reaction fire. The Lurhgg behaved as intended, although the blip system threw up a huge number of them at the end of the game, at which point my lunch break was over and I decided to quit. The system does what I wanted it to quite well. The problem is that it is geared toward evenly matched forces and I want there to be a degree of unpredictability as to what the player will face. This same problem is what I had with Ganesha Games "Flying lead" when I tried it solo.. Too many fiddly states a model can be in. I don't mind the varying states, but playing solo it's hard to remember to do everything properly and the game has ended up with a lot of counters. This is largely an issue with any alternating activation game where all models get to act. I need to think more about this. Remove “wounded” state entirely. Instead, have shock counters impose a -1 to rolls as the rule currently stands, and give models a shock threshold. When this threshold is reached, the model dies. 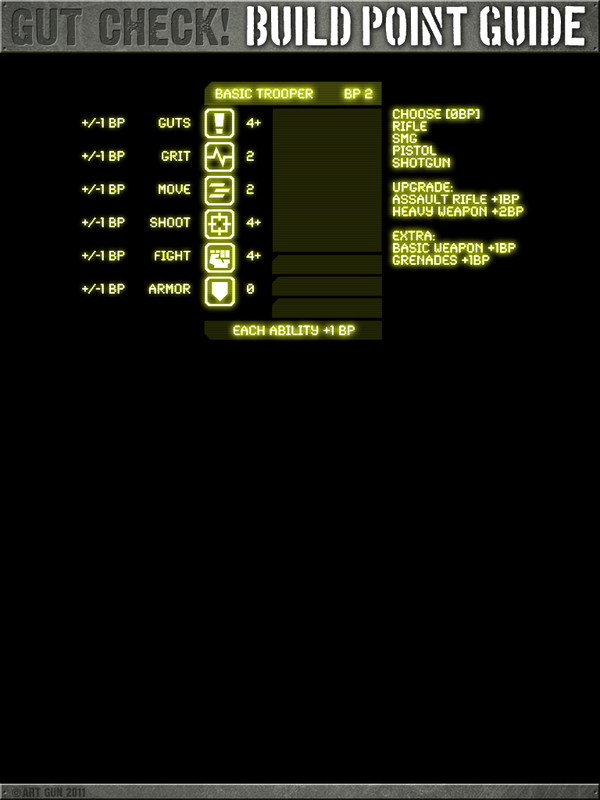 "Mook" and "Hero" troops would be easier to model with this system and there would be less modifiers in the charts. 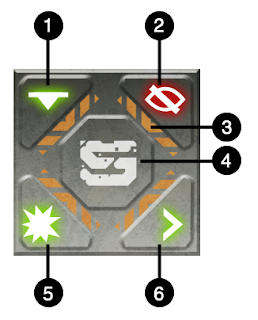 As shock counters roll to be removed in the end phase, this would be a bit like regenerating shields in Halo. I'm going to give this a try next session. Damage rolls (modified by weapon vs armor) result in either Duck (recoil) Choke (Freeze up for rest of turn) or Shock (-1 to all rolls per shock counter). Models now have a Grit rating, which is how many shock counters they can accrue before dying. Heroes and large creatures have 3 or more, ordinary troops have 2 and civillians/disposable mooks have 1. 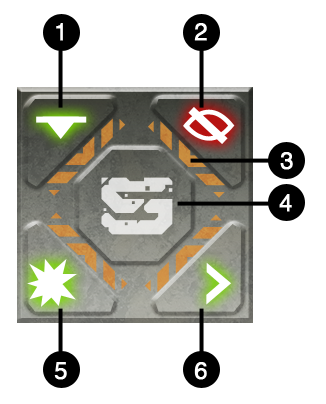 Shock counters can be removed in the recovery phase if successful gut checks are made. In the absence of proper markers, I was lying models down to show the "Choked" condition, green markers to show Evading or falling back models,white counters to show that a model had stopped, and red markers for shock. It worked a lot better.